Among the man himself there are many ghosts and demons in this man is among the most feared. holding a pet kitten in his arms. 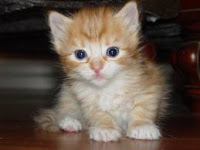 The kitten is small and white with huge, appealing eyes set in a tiny face. on,the boy and the little cat were seldom a part. Rene took the kitten to school-ot least until the teacher objected. It slept on his bed, often sat on his knees at mealtimes. "If anything happens to that cat, I dread to think what Rene would do," Michelle leret remarked to her husband one night. "It would break the boy's heart." But when that day came, there was no grief in the cottage on the edge of the village of Sampier, near Lyons in southeastern France. For it seemed that not even death could separate Rene Leret and his pet. The events at Sampier, at first written off as a small childs fantasies, soon attracted the attention of France's top ghost hunters. "I have studied well over 2,000 cases in the course of my career," wrote Dr.Gerard Lefeve of the French Society of Psychical Research, "aand only five times have i failed to put the supernatural into natural terms. One of these was the case of the kitten at Sampier." It was the first week of August in 1954 when Rene's uncle came to visit, bringing presents for everyone, including the tiny kitten for Rene. Immediately, the child christened it Jacques, and tookit with him everywhere. But the friendship-at least in normal terms-was to last only a month. One Saturday morning the kitten suddenly dashed through the garden into the main road. An oil truck on its way from Lyons to Dijon dashed the life from the tiny scrap of fur. The parents kept the boy away from the scene until all traces of the accident were removed. "You must not be too sad about Jacques," Michelle Leret gently told her son. "We will get you another little kitten to take his place." "I don't need another one, Mother" the boy replied. "Jacques is here sitting by the window." He reached out to stroke the air a few inches above the window ledge. The parents regarded the action as a defense mechanism shilding Rene against the grief of losing his pet. Doubtless it would disappear in a couple of days. But it didn't. Jacques had to have his food put out as usual; the door had to be opened to let him in; the cushion on which he had slept had to be in its place on Rene's bed. one day, Charles Leret told his son gentlybut firmly that the pretense had gone on long enough. The child was bewildered: "But what do you mean? Jacques is here on the carpet-can't you see?" The next day the worried parents called a doctor and told him their child was suffering from hallucinations. But examinations-culminating in hospital tests-could find nothing mentally wrong with the child. Dr.Lefeve, hearing of the phenomenon, arrived at the village at the end of September. He had several long interviews with the child and his parents, and he carried out several routine tests. He found that when the child entered the room the temperature appeared to drop slighly-always a sign of a "presence." Examining the inside of the front door; he found minute scratches around the bottom, apparently made by cat claws. Yet the door had been newly painted-after the cat had died. Then there was the photograph. Dr. Lefeve was in the Leret house when it came back from the local pharmacy. The folder containing prints from a roll of film taken by Charles Leret was opened and the contents casually examined. There were pictures of the house, the family and the garden. And there was a picture of Rene, taken near the garden gate. Charles Leret's hand shook as he handed the picture to the doctor. Rene, in his best clothes,looked strangely solemn. In his arms was a white kitten. "The parents were astonished," Dr. Lefeve recalls. Whan the photo was taken, there was no kitten or anything else in the child's arms. I examined the photograph and there was no doubt that the object was a kitten. "I asked the parents every question I could think of and they answered willingly and honestly, but they could not throw any light on the mystery." And no one ever has. For the picture of Rene Leret had been taken three weeks after Jacques the kitten had died. I remember reading of this as a child; indeed, the book reproduced the photo! What book or where could I find the picture? Would love to see it! Swallowded by a Whale-and He Lived! "Secrets of success of human life is preparation for the celebration of the opportunities appear. " Thank You Please came again. Simple theme. Powered by Blogger.